Free Shipping Included! CyberPower RMCARD305 Remote Management Adapter by CyberPower at The Square SC. MPN: RMCARD305. Hurry! Limited time offer. Offer valid only while supplies last. 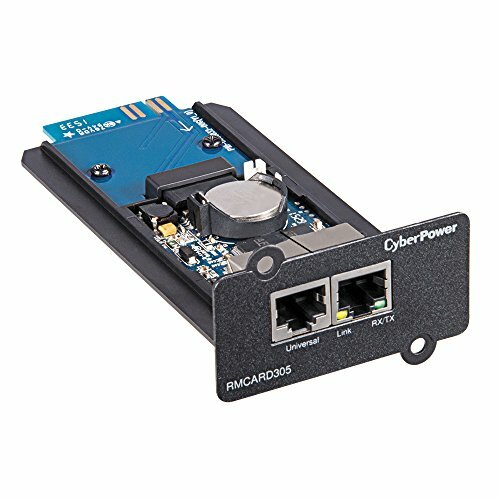 The Cyber Power RMCARD305 is a full-featured network management card that remotely manages, monitors, and controls Cyber Power OL Series UPS systems. The Cyber Power RMCARD305 is a full-featured network management card that remotely manages, monitors, and controls Cyber Power OL Series UPS systems. The internal card allows remote monitoring and control via Web Browser or NMS connection. By utilizing the Power Panel Business Edition Client auto-shutdown software, servers and workstations stay protected from data loss due to power failure. An optional environmental sensor (ENVIROSENSOR) can be added to monitor ambient temperature and humidity. Event logging tracks UPS events and input/output status records. Automated event notifications via email, SMS text, SNMP Traps, and Syslog server can be setup to insure real time status of changes. Firmware can be updated by users to insure you have the latest features and updates. MD5 security management is also provided to protect the integrity of the network. Secure emails are delivered using either SSL or TLS. User log in accounts can be secured through either: RADIUS, LDAP, LDAPS, or Windows Active Directory authentication protocols.